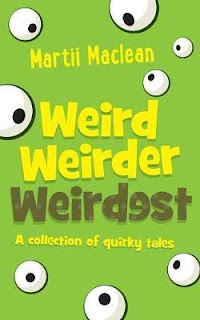 Weird Weirder Weirdest is the perfect title for this addictive collection of fun and quirky short stories. A pen that writes what it wants no matter what the holder intends, a watch that can stop time (but comes with consequences), super ugly shoes that make you run super fast. But my absolute favourite was a futuristic tale about a society that trades energy for education. And to make an energy payment, kids must constantly rotate a mechanical ball with one hand, making playtime impossible. I love the story worlds author Martii Maclean has created in this book. Each one pulled me in, and the endings always left me begging for more. At their conclusion, I sometimes still had questions, and I adored this. It gave me a rare opportunity to stop and think about what would, or could, happen if the story were to go on. And what a gift this is for kids. It will spark their imaginations and get them wondering and thinking, which is exactly what a good book should do. And all the characters are very relatable for children. Many are underdogs, all of them have flaws and struggles and they all must find courage to beat the obstacles they face. With bite-sized stories, perfect for kids moving to longer books, Weird Weirder Weirdest is filled with entertaining and interesting tales junior readers will absolutely love.